Yes, you heard that right! Yamaha has introduced four new paint schemes for the R15 in Indonesia. In contrast, we received the new R15 just a couple of months ago, draped in Yamaha’s Racing Blue and Thunder Grey with no premium shades on offer to keep costs in check. All four colours in question receive different sets of decals. While the Racing Blue is quite similar to the one offered in India, it helps the R15 V3.0 stand out thanks to blue-coloured alloys as seen on its elder siblings – the R3, R6 and R1. The Racing Yellow & Black, on the other hand, get colour co-ordinated rim tapes. The best of the lot, in our opinion, is the fourth option - the MotoGP inspired Movistar livery. The R15 V3.0 is currently the most affordable track-focused entry-level bike you can get your hands on. It borrows design cues from its elder siblings with a muscular fuel tank, twin all LED headlights, LED taillight and an aerodynamically designed faring. Both the Indian and Indonesian versions share the same 155cc single-cylinder, liquid-cooled, fuel-injected engine with Variable Valve Actuation, which produces 19.22PS at 10,000 rpm and 15Nm of torque at 8500rpm, paired with a 6-speed gearbox. Features that the Indian version misses out on, as compared to the Indonesian R15, include upside-down forks painted in gold, aluminium footpeg assembly, hazard lights and grippy metzeler tyres as standard. All this extra hardware does come at a premium, as the Indonesia-spec model is priced at IDR 35.2 million, which is equivalent to Rs 1.60 lakh. The India-spec R15 V3.0 is built around a deltabox frame and comes with conventional telescopic forks up front and a monoshock at the rear. Braking duties are handled by disc brakes at both ends, however, it misses out on ABS, even as an option. Its 17-inch wheels comes shod in 100/80 and 140/70 section tyres at the front and rear respectively. Additionally, the rear can wheel can be shod in H-rated Metzeler Sportec M5 which is offered as an accessory. Though there’s no word on when these colour schemes will be introduced in India, the new colours available abroad do give us an indication of what’s to come in the near future. 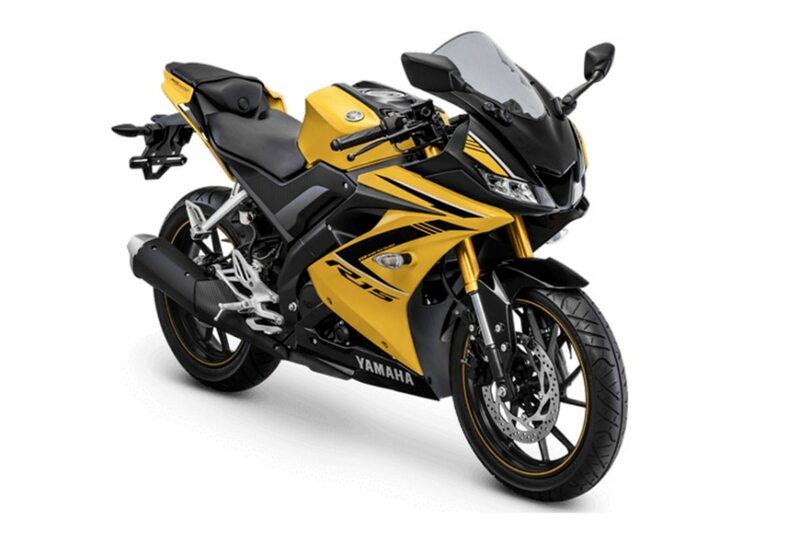 The 2018 R15 V3.0 competes with the Suzuki Gixxer SF and the Honda CBR 150 R in the Indian market.